Regarding this picture: it is a real good example of red lighting and white lighting. The receptacles are actually identical, one with a red globe and the other one with a white globe. Inside is an ordinary incandescent light bulb. While at sea, and dived, the OOW [Officer of the Watch] at dusk or twilight would order the control room only to switch to bright red light. The other compartments would stay in white light 24 hours a day. Mind you for daylight hours there were also fluorescent lights. Black out Curtains on a Windowless Submarine? 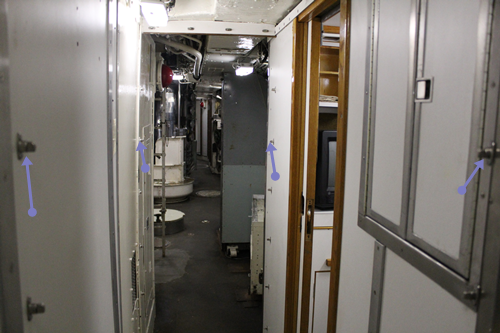 This difference in lighting conditions is the reason that each end of the control room was fitted with blackout curtains. Two sets of heavy canvas curtains [fixed with butterfly bolts]. You would leave a "white" compartment, enter the first double curtain, stay there in the dark for several seconds to get your vision to adapt, then, go through the last set of curtains, and you were now in a dimly lit control room. This is why, at night, you would see the captain wear a special pair of very dark goggles. Should he be called to the control room from a "white" compartment he would still have his night vision. Others found different ways to deal with the changing light conditions. There was nothing funnier than to see some poor electrician rushing through the control room from a "white" compartment without taking time to adjust his vision, they would trip all over, some had it down to an art and would follow with their hands the pipe work or wire on the submarine deckhead. With nothing going on, that is no exercise, the control room would stay in bright red light. At the first hint that perhaps there was a "dreaded" red enemy, they would immediately switch to dim red lighting, meaning that perhaps 75% of the red lights were turned off. 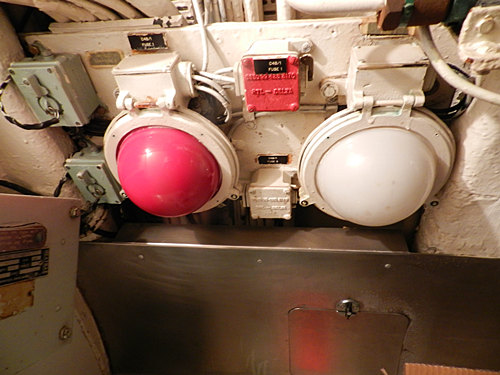 Upon just coming to periscope depth, the OOW [Officer of the Watch] would order the control room to go to "black" lighting, meaning that all red lights were turned off. 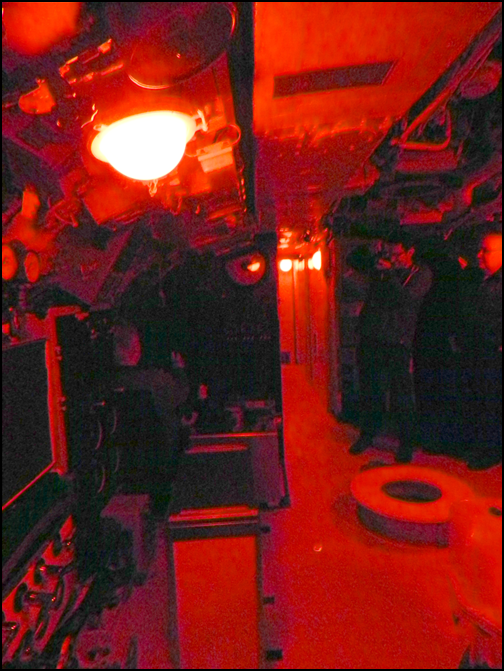 The only source of lights was from the various gauges that had a red background light and were necessary for the control of the submarine. As the CERA (Chief Engine Room Artificer), I would have to be present in the engine room for every diesel start up. My bunk was on the "white" side of the curtain in the "goat shed". The goat shed was always kept fairly dark to help me out. I would stay between the curtains and once I stepped in the control room, I would use my booming voice to say "CERA coming through" That would assure me a clear path to the engine room, no one stood in my way. By the way the two grey small boxes with a removable cover attached to a chain, were actually plug sockets, but used a bayonet fitting as opposed to the normal 3 pronged plugs.